Professor of Biology and Environmental Studies Aaron Ramirez was hired last spring. His research mainly focuses on the effects of fire and drought on plant communities. 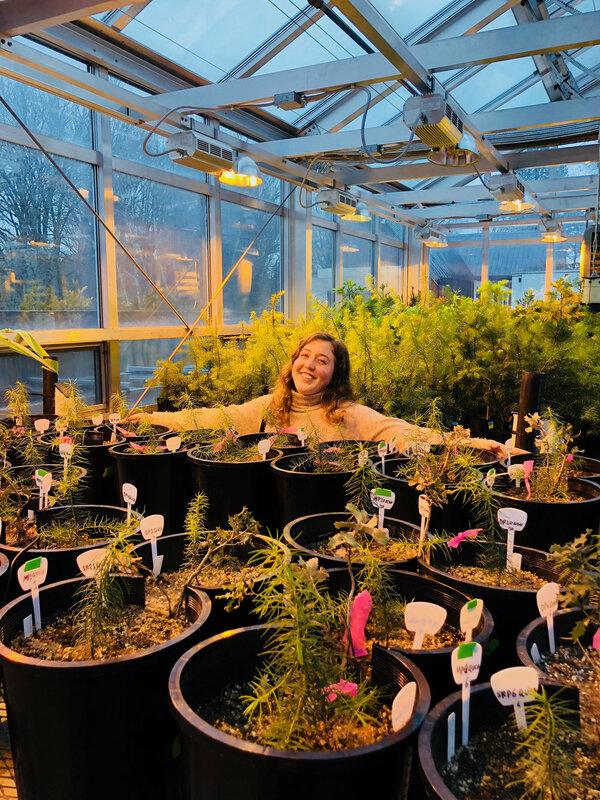 Dr. Ramirez’s first four thesis students will be graduating in May 2019, and all of their theses focus on different aspects of plant responses to drought, fire, and pollution in Oregon. Professor Aaron Ramirez: I think that one of the things that I was most excited about when coming to Reed was the opportunity to work with students on their thesis projects. The students have lived up to and exceeded my expectations. The thesis projects are really great, the students are really great, and it’s been more than just hard work — we’ve been having a lot of fun, too. I think that one of the most important things about science is being able to mentor other people — it helps you to learn better, it makes the science have broader impacts beyond the academic community, and several of the thesis students have gotten the opportunity to work with middle school students on science fair projects related to their thesis. One of the things that’s been great about the theses is just how diverse the questions that the students are asking are. They’re related to the work we do in the lab, but they’re also pushing the boundaries of what the lab does in a bunch of different directions, and that diversity has been a highlight of the way the thesis process has gone. I don’t have much of a frame of reference, but if this is what working with thesis students is like, it’s going to be a lot of fun! Edward Zhu: For my thesis, I’m attempting to measure the effect that tree height has on vulnerability to climate change-induced drought. We are collecting samples from tall (~200 foot) and average (~100 foot) Douglas fir trees in Powell Butte Nature Park. This involves climbing to the very top of the tree, and cutting 15 cm branch segments from the canopy to bring back to lab. We measure hydraulic conductivity by connecting that segment to tubes and a scale hooked to a computer that records the flow rate through the stem. This flow rate tells us how much drought the stem has experienced. We can simulate different levels of drought by placing the stem segments in a centrifuge, which allows us to generate a curve depicting how vulnerable those stems are to different drought levels. Douglas fir trees produce more lumber than any other species in North America and are also an important component of forest ecosystems throughout the western part of the continent. Since tall trees are able to provide more ecosystem services, it is important to understand the impacts on these ecologically, economically, and culturally significant trees. Indra Boving: My thesis looks at the effect of fire on the ways that trees move water through their stems! Specifically, I am looking at how heat from flames might make trees more or less vulnerable to drought by submitting Ponderosa pine, lodgepole pine, and aspen seedlings to heat plume treatments and comparing each group's capacity to transport water and maintain its hydraulic function under drought conditions. Hopefully this information will help foresters minimize tree mortality during prescribed burns and will help explain why some trees die and others survive during drought events. The best thing about my thesis has been getting to spend time out in the field in Eastern Oregon, and learning with and from my lab group as we climb trees, write, and do science together! Erica Bull: My thesis is about the effects that proximity to a major road has on Giant Sequoia health. I was inspired by a paper published in 2018 claiming that anthropogenic hygroscopic aerosols are forming layers on tree leaves that accelerate drying during hot dry periods. Basically, pollution is the opposite of lotion for trees. Some possible impacts of my thesis include understanding the tree health impacts of living on a roadside. So far, roadside trees appear to be losing 90 percent more water than ones not near the road! Working in the Ramirez lab has been so wonderful. Aaron is a patient and helpful mentor, and my lab mates are kind and smart! Couldn't have asked for a better team. Note: If you collect tree samples from the side of the highway, you may get honked at. Piper Rodolf: My thesis mainly involves me standing in the greenhouse on the roof of the biology building and staring at plants all day. In doing this, I’m trying to understand the relationship between two species, bigcone Douglas fir and canyon live oak. These species are often found growing together in their native habitat of southern California. Canyon live oak is suspected to help bigcone Douglas-fir seedlings establish themselves, but the mechanism at work in this interaction is still unknown. The answer is likely either that the canyon live oak-specific soil mycorrhizal community benefits bigcone, or that canyon live oak may be redistributing soil water through its roots in a way that can help bigcone cope with the hot, dry conditions it grows in. Either way, in the face of climate change, increasing droughts, and wildfires, understanding any mechanisms that may help plants compensate for hot and dry conditions is crucial.